Are you suffering from rough and dry skin when you touch it? Are you tired of your harsh skin? Daily sun exposure, heat, heavy makeup, pollution, dirt and harsh chemical soaps make your skin even more rough and dry. Herbal and natural products are harmless to skin. 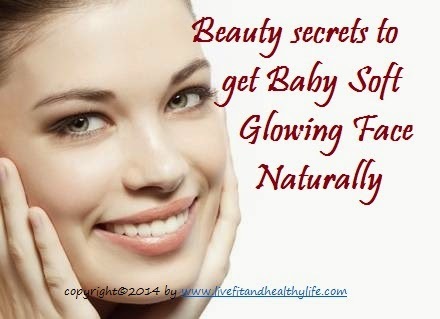 Here are some simple steps you can do at home to get baby soft pimple free glowing clear skin. If you want a beautiful glowing face, the first and the most important thing is good hydration. No makeup can help you with dry skin. Inner hydration is just as important as outer, so first and foremost – drink a lot of fluids. You should drink between6 and 8 glasses of water every day. Remember that for every cup of coffee you drink, you should drink two cups of water, because coffee actually dehydrates you. For same reason try to avoid carbonated drinks and alcohol. When it comes to outer hydration, I’ve got one word for you – moisturizer. Get one for day and one for night, since they are different and you should have both if you can afford it. Apply it daily. Before you put your makeup on, apply moisturizer in order to protect your skin from the dryness that makeup creates. The best answer to the question about how to make your skin glow would be to make sure that you glow from the inside. This may sound like a cliché, but it works. As long as you are a happy and satisfied person, that will show on your face and your skin will absolutely glow. This is sometimes not very easy to reach, but we can help you with that too. Whenever you feel down for some reason, think of all the good things. You must have things in your life that make you happy and things that are worth living for. If it’s easier make a list of all the good things in your life. Once you see them, you will find your inner glow and satisfaction that will be visible on your face. Focus on the positive. Life is what you make out of it. Life is good, so let it glow. There is nothing else in this world that will make your face glow more than a simple smile. No matter how you look, if you are wearing any makeup or not, throw in a simple and sincere smile and your face will certainly glow. Stand out from the boring crowd. Don’t worry about the smiling wrinkles; those are the cutest wrinkles a woman could have. They show that you are a happy and friendly person, a woman that’s satisfied with her life. Smile as much as you can, because it not only makes you look great, but it also prolongs you. Making your face glow is easier than you might think. Just follow our advice and you are sure to look beautiful. You need to consider your health as a very important factor in making your face glow. Bad habits such as smoking and drinking do a lot of damage to your skin, and you should really try to get rid of them. Eat as healthy as possible – a lot of vegetables and fruit, white meat and fish. Avoid red meat, sugar and processed food. The things you eat show on your face, so start eating healthy and your face will start to glow. It’s not rocket science. Moreover, always, and I mean always, apply sun screen to your face. Buy a sun screen specially for your face because it should be with a higher factor than the one you apply to your body. The sun screen should be alcohol-free, because alcohol makes your skin dry. Establish regular visits to your physician to check your health and visit your dermatologist if you have any problems with your skin. Don’t think that buying expensive skin products is the key to making your skin glow. Take my advice and try some homemade skin products. In case your skin is oily: make a tonic out of water, lemon juice and rosemary. Put a tablespoon of rosemary leaves in a mortar and crush them with the pestle until they release the juices. Strain this to get only the juice and mix it with juice from 1 lemon and 1 cup of water. Clean your face with this tonic every evening and apply moisturizer as usual. It’s cheaper and healthier. On the other hand, if your skin is dry, mix a paste you made from a handful of strawberries with high percent fat yogurt and apply it to your face. Leave it for at least half an hour and then rinse with warm water. Do you or someone you know grows Aloe Vera? Get the juice out of the cactus and use this as a tonic. It makes your skin soft and helps with keeping your skin pure. You can also use aloe products from the store; just make sure that they actually contain Aloe Vera. I use and recommend Aloe Activator from Forever Living products.